A few years ago, before we converted to apartment living, we used to live in a townhouse built in the 70s. One of the things that I loved/hated about the place, was that in the living room, we had a ledge that ran the entire width of the room (I think it was meant to be a breakfast area for bar stools), and we used it to store random junk. It was impossible to keep it clean. 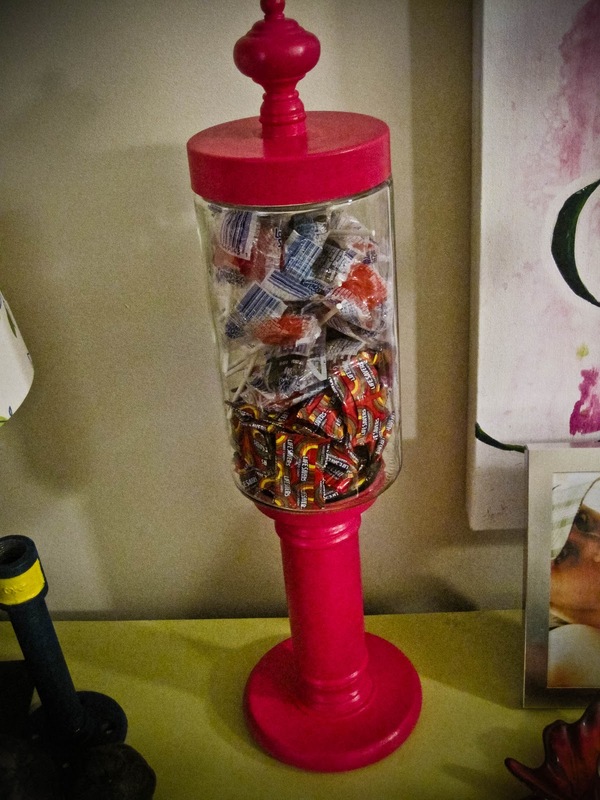 But, one of the items that we displayed on the ledge was candy jars- and our guests would love to help themselves to candy whenever they visited. Due to downsizing, the 4 candy jars were one of the things to go, due to a lack of space. 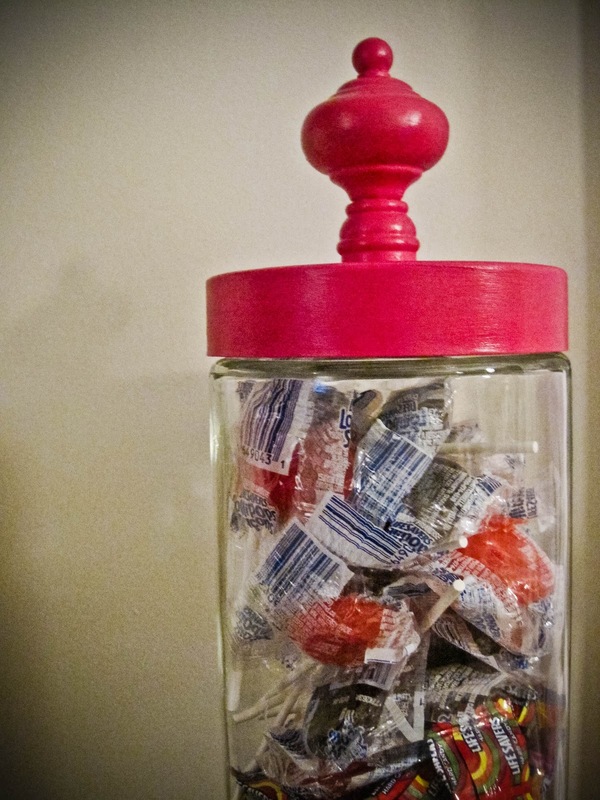 What didn't change was our habit of keeping a bit of candy around the house, and it's often difficult to find a place to store it. With the removal of some of our Fall decor, I managed to free up a bit of space on our Living Room Dresser. The problem I struggled with was finding a candy jar that wouldn't get lost amongst the other decorative items- if only there was a way to give it a bit of height, the jar would be more accessible, and it would be easier to create a sense of layering in the dresser vignette. Enter an old wooden pillar candle holder from Debbie Travis' home collection from approx 2006. I purchased the candle holder because it had a bit of height to it, and at the time, I couldn't find any pillar holders I cared for that were in my budget range. I'll admit, I was never too keen on the look of it- it was very plain and streamlined, and lacked any sort of embellishment, and thus, has been living in the back of a storage cabinet for the past few years. 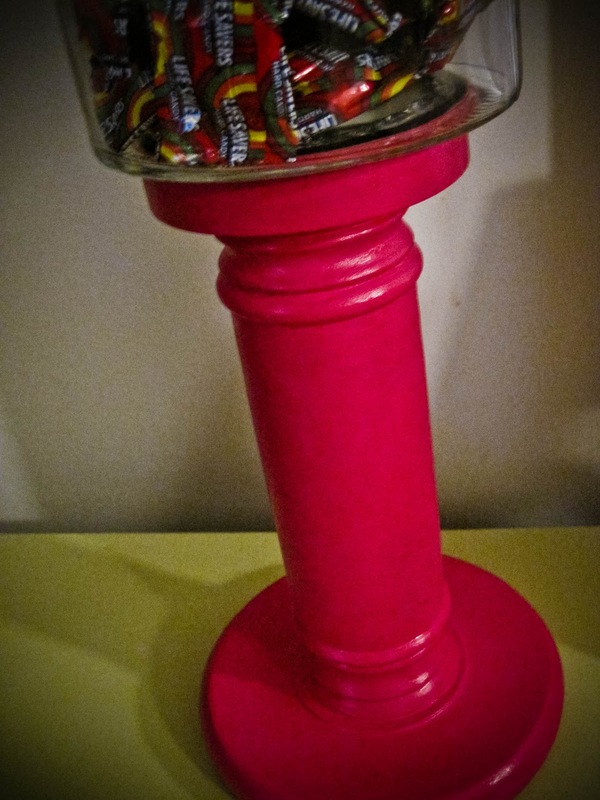 I was at the point of wanting to donate it when, I decided to use it as the base of the candy jar to give it a bit of height! For the jar itself, I purchased a simple glass jar from the dollar store (for a whopping dollar!). The jar had a silver lid, and I really wanted the jar and the candle holder to feel cohesive. The cure for that particular ailment? : paint, of course! I teetered back and forth between painting it a deep green, or a muted blue, but I really wanted to give it a bit of punch, but just couldn't come up with the right shade. I asked Jackie for advice- her suggestion: hot pink. And hot pink it was! I used the same color as our pink feature wall, just for continuity (and because I already had it, and didn't need to purchase any more paint!). Prior to painting, I removed the lid from the jar, and attached an old finial I had kicking around, just to give it a finishing quality. And the finial went perfect with the lines of the candle holder base. I primed all the pieces, slapped on severeal coats of Benjamin Moore's Peony, and gave it all a very light coat of water based clear coat. Once everything was dry, I attached the base to the jar by using a generous amount of clear glue (I chose a glue that was meant for fixing fish tanks and other glass applications). The only set back in the entire project (and there's always at least one!) was that I didn't handle the finial/ lid with care while the glue was setting, and it came off! Oh well, nothing that a bit more glue and paint couldn't fix. The hot pink certainly delivered that punch I was looking for. I filled it up with some LifeSavers candies and lollipops for the time being- but I can't wait for Christmas to approach and to stack it full of red and white peppermints, or some bright Quality Street chocolates! YUM!